Rain rain rain. Last Sunday was a great day to spend a few hours at MASS MoCA, one of my favorite art institutions within driving distance. 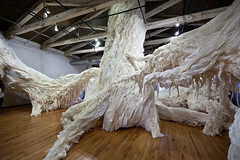 The current exhibitions at The Massachusetts Museum of Contemporary Art include work by Leonard Nimoy, Petah Coyne, Sol LeWitt & Iñigo Manglano-Ovalle to name only a few, though a couple of installations are worth the trip alone. I don’t think my English is good enough to articulate what I feel about modern art, but hopefully the photos below will come to the rescue. 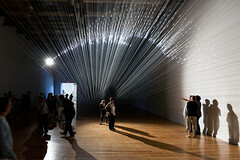 If you are not familiar with MASS MoCA and its mission, pick a few open-minded friends and enjoy a beautiful trip to Massachusetts, 1h15 east of Albany. 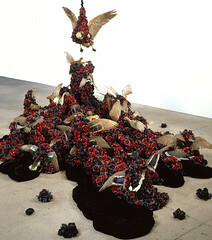 The museum opened in 1999 and ranks among the most visited institutions in the USA dedicated to contemporary art. I was impressed by the grandiose size of the building and its industrial character the very first time I drove to North Adams. This fits naturally with my interest for capturing large, abandoned industrial structures and I’m grateful the museum allows cameras in (most of) the premises. With about 110,000 square feet of open space MASS MoCA is able to commission and display art of unusual and inspiring scale. It will take at least 2 hours to see most of the installations, though I suggest you try a guided tour at some point. I am very ignorant with respect to paintings for example, but I remember spending a rewarding half an hour in front of one large piece from East Germany a while ago, listening to what our guide was deconstructing. Take your time, listen, question. The museum also offers live performances year-round, including popular music, contemporary dance, alternative cabaret, dance parties, films, etc. The first exhibition we walked by featured a collection by Petah Coyne, “Everything That Rises Must Converge” (PDF brochure). Her work on display is nothing short of beautiful. Victorian, decadent and morbid comes to mind. In a gorgeous series sprawling the 3-story Building #4, she mixes sensual materials like satin, wax and velvet with organic elements such as trees, black sand, and taxidermy animals. This was, unfortunately, the only floor we weren’t allowed to take pictures of (photo above found at massmoca.org). 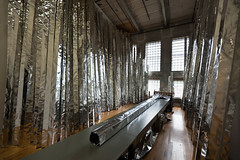 MASS MoCA is all about provocative visual and performing arts pieces. I leave you with the mental picture of a tree coated in black sand, stuffed peacocks perched on its branches and pheasants hanging upside down. 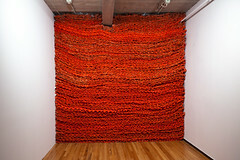 In this photo above, “Re-projection: Hoosac” by Tobias Putrih, part of “Material World: Sculpture to Environment”, a group show devoted to large-scale installations made from modest, industrially produced materials. Behold a playful yet elegant piece, a simple optical trick that catches the eye and tickles the brain. A set of fishing lines stretches across the gallery, starting high from one wall, ending low at the other. 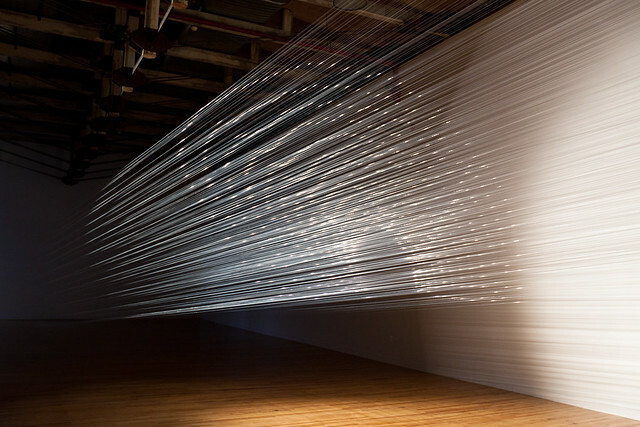 A spotlight hits the strands of monofilament which in turn become a screen, reflecting an image in illuminated dots. 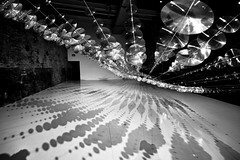 Watch the piece change as you walk under its strands. Step inside its luminous arch and fear for your neck. 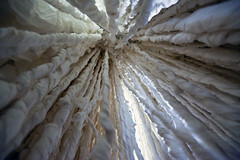 In this photo: “White Stag” by Wade Kavanaugh & Stephen B. Nguyen, also part of “Material World: Sculpture to Environment”. 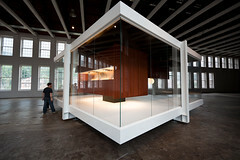 This is yet another piece successfully using the ample space provided by the museum. 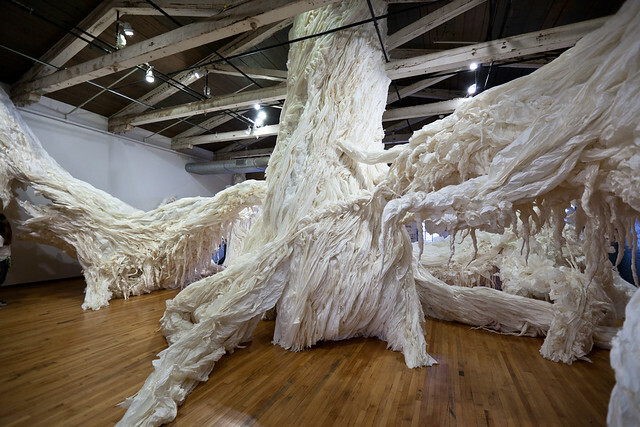 Above is a richly textured forest fashioned from “twisted, crumpled, and draped rolls of paper”. 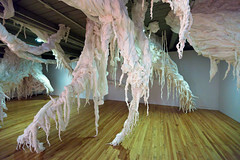 The installation spans two floors, growing from one gallery to the next, joining two separate spaces (see photo of the “roots”). A tremendous amount of work I’m convinced. Some of the trees are hollow and provide an intimate space to hide, surrounded by a curtain of vines. Nap time. Pictured above, “Gravity is a Force to be Reckoned With”, a project by Iñigo Manglano-Ovalle (PDF brochure). This one didn’t do much for me. Feel free to read the artist statement, it is fairly convoluted. At the end of the day this struck me as just another house inverted, “the ceiling of the original becoming the sculpture’s floor, the floor becoming the ceiling”. Not that original. 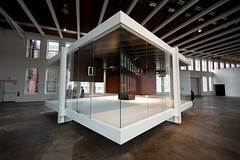 My other issue is how this small structure seems to waste the largest gallery in the museum. I remember catching very intimidating installations in Building #5. Carsten Höller’s spooky Amusement Park in 2006 for example, packing five full-sized amusement park rides in its generous space. Jenny Holzer’s PROJECTIONS, one of my favorite piece in 2008, an engaging show that also managed to fill this hangar, with seemingly nothing but light. Above, one of the colorful (O RLY?) 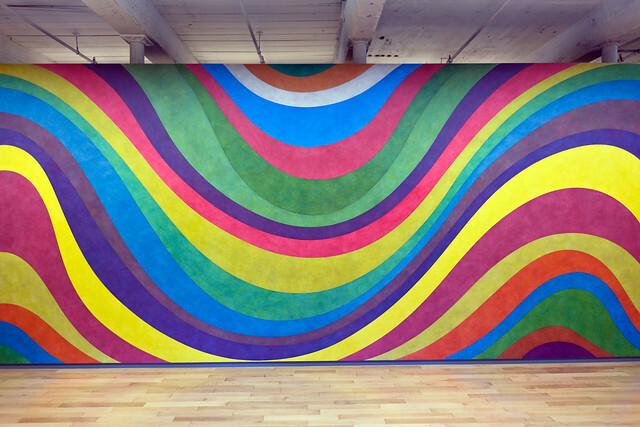 pieces to be found in the “Sol LeWitt: A Wall Drawing Retrospective” exhibition. The show comprises 105 of LeWitt’s large-scale wall drawings, spanning the artist’s career from 1969 to 2007. These occupy nearly an acre over three stories in Building #7. I quote the brochure: “LeWitt—who stressed the idea behind his work over its execution—is widely regarded as one of the leading exponents of Minimalism and Conceptual art, and is known primarily for his deceptively simple geometric structures and architecturally scaled wall drawings”. Now what is really behind this “idea over execution” statement is that this exhibition was completed after nearly six months of intensive painting by a team of sixty-five artists and art students. This is an issue for some, who consider an artist should be involved in the actual, physical creation of the art. 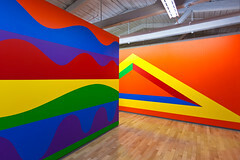 I don’t have a huge problem with that, but then again I don’t put Sol LeWitt on a very high pedestal either. If I had a huge wall to spare and wouldn’t mind the occasional color-inducing headache, I could live with this great piece above, of course. “Big Boss” by Orly Genger, another work part of the “Material World: Sculpture to Environment” group show. 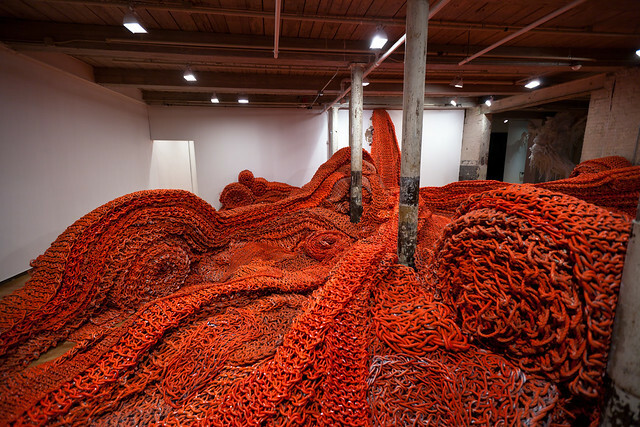 Created with 100 miles of red knotted rope of different thickness, this installation starts with a massive wall and rips open the gallery partitions to spill into adjacent rooms. I liked this representation of a fluid made of such a strong material. The “Big Boss” of the title, according to the brochure, might refer to the labor the rope demanded of Genger. That sounds like an understatement, considering the extravagant extent of this piece. 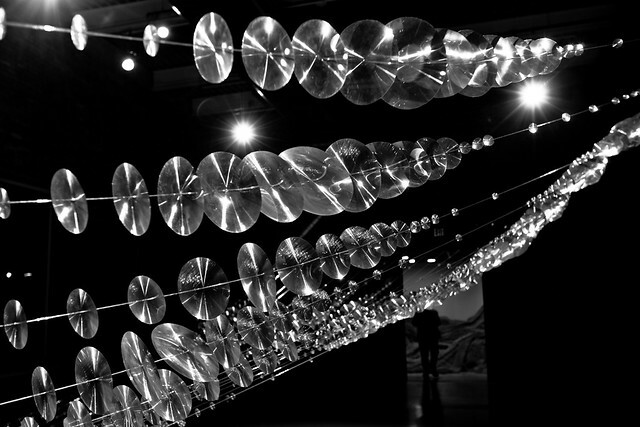 Pictured above and in the header of this post, “The Geometry of Light” by Alyson Shotz, part of “Material World: Sculpture to Environment” (PDF brochure). 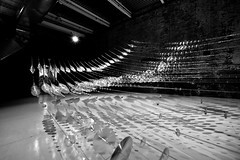 Similar in concept to “Re-projection: Hoosac” by Tobias Putrih, I really enjoyed this vibrant installation. Shotz uses reflective and transparent materials, including piano wire and Fresnel lenses, to literally stretch light and shadow across the room. This is the type of piece that really invites you to play with every possible angle, to interact with the material and the spotlights. It’s uncomplicated yet well conceived. Don’t miss that room. Above and below, a few pieces from the “Leonard Nimoy: Secret Selves” exhibition (found online, no photos allowed). No need to introduce artist/actor Leonard Nimoy, this show exhibits his recent photographic series that explores the lost or hidden self. I quote Massmoca.org: “Inspired by Aristophanes’ theory that humans were once double-sided creatures with two heads and multiple limbs before Zeus cleaved man in two and left him forever struggling to be whole again, Nimoy’s photographs reveal his subjects’ other half. Shooting in nearby Northampton, Massachusetts, Nimoy recruited volunteers from the local community with an open call for portrait models willing to be photographed posed and dressed as their true or imagined secret selves”. Shot with a medium format camera and printed at almost life-size scale, this series of photos is quite a sight. If you are a photographer, enjoy the camera envy. Not every piece is a hit, it really depends on the “secret self” itself, but I really command Nimoy for a few subversive pictures… that I’ll let you discover. That’s about it for this little trip to MASS MoCA. Also on display, Disfarmer Photos and Jörg Immendorff: Student of Beuys. If you are into contemporary art and you are new to the area, you owe yourself to take this trip every 6 months or so, you won’t regret it. 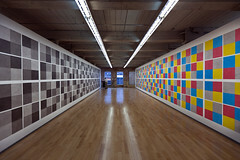 MASS MoCA is located at 87 Marshall Street in North Adams,MA, about an 1h15 east of Albany, NY . Need more info? Call the box office during business hours at (413) 662-2111, or check the directions page. If you feel even more adventurous, stop at the Grafton Peace Pagoda on your way in, enjoy a nice restaurant near North Adams and stop at the Clark Art Institute on your way back. The admission is $15 for adults and passes for the whole year can be bought at the register. 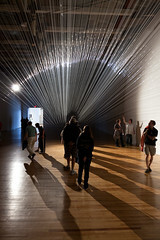 This entry was posted on Monday, August 23rd, 2010 at 6:20 pm and is filed under Art, Exhibition. You can follow any responses to this entry through the RSS 2.0 feed. You can leave a response, or trackback from your own site.